On the evenings of September 13th and 14th, the Eiffel Tower was set for a completely unique light show to celebrate the 160th anniversary of diplomatic relations between Japan and France. The special light show was designed by two internationally renowned female designers: Motoko Ishii, a Japanese pioneer in the world of lighting design, and her daughter, Akari-Lisa Ishii, a Parisian designer. As a leader in high performance LED drivers and lighting controls MOONS’ was honored to participate in the spectacular project, and provided 50W DMX intelligent drivers powered the show. The drivers controlled the red, green, blue and white (RGBW) LED luminaires which were equipped with 16-bit resolution DMX drivers. When used together, these lights will be mixed to create over 18,000 color combinations. 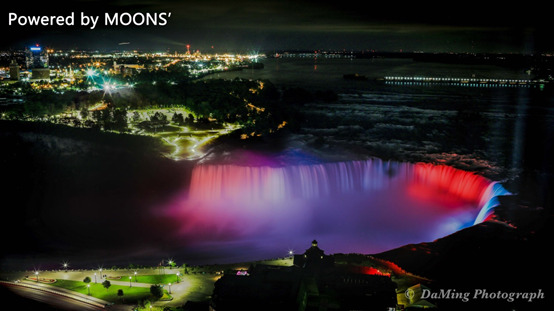 Previously, MOONS’ DMX drivers were successfully installed in the renovation project of the Niagara, American and Horseshoe Falls, one of the 8 wonders of the world. 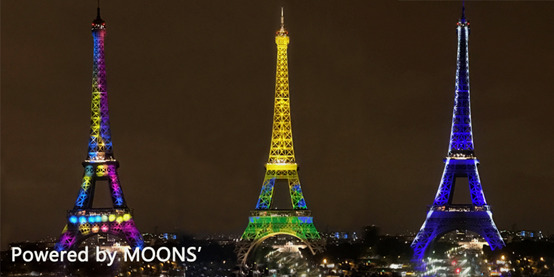 MOONS’, a customer-oriented organization, will be always engaged in pursuit of excellence providing high efficient, energy - saving, and smart total solutions and products to meet the latest requirements in the industry.